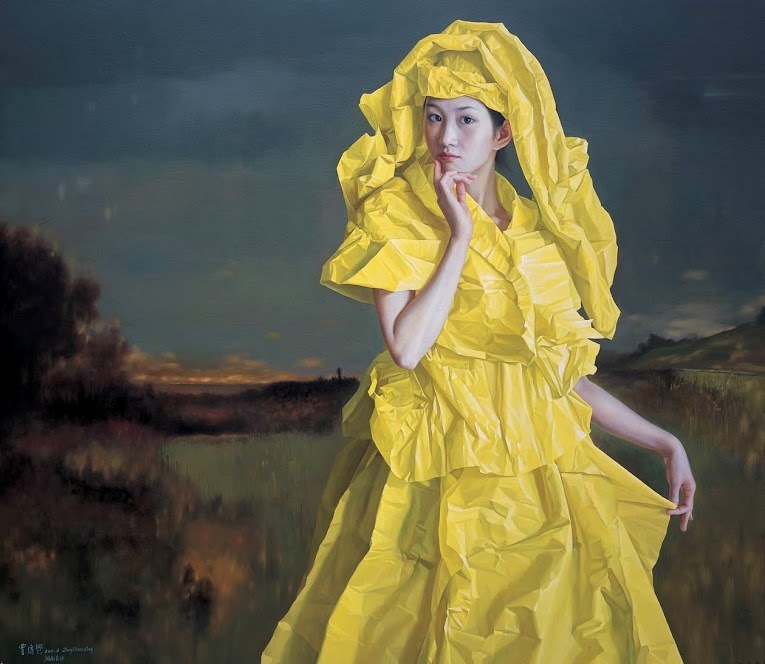 Zeng Chuan Xing’s Paperbride series of realism paintings is executed with oil on canvas. 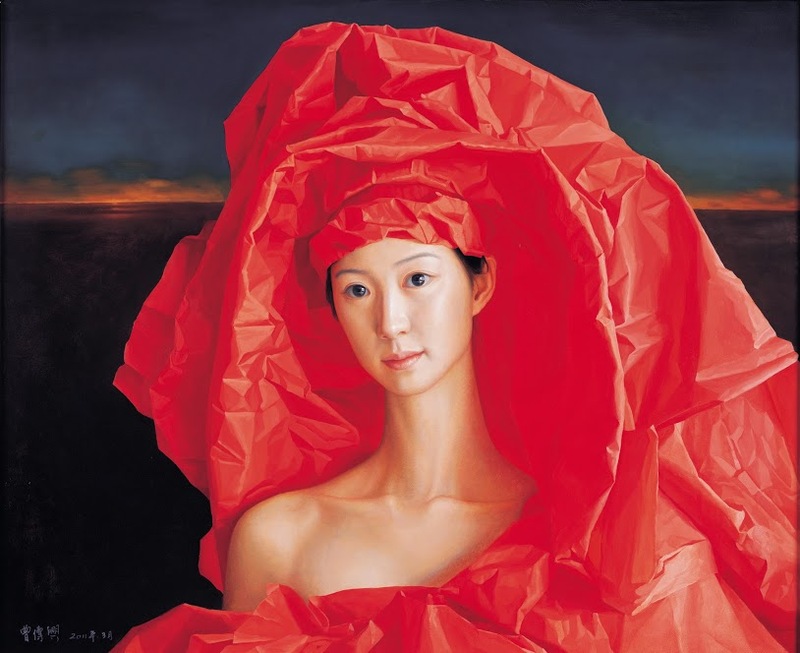 Inspired by a close friend whose failed marriage caused him to reflect on the meaning and nature of marriage in today’s fast changing society, Zeng’s brides exude a touching melancholia. 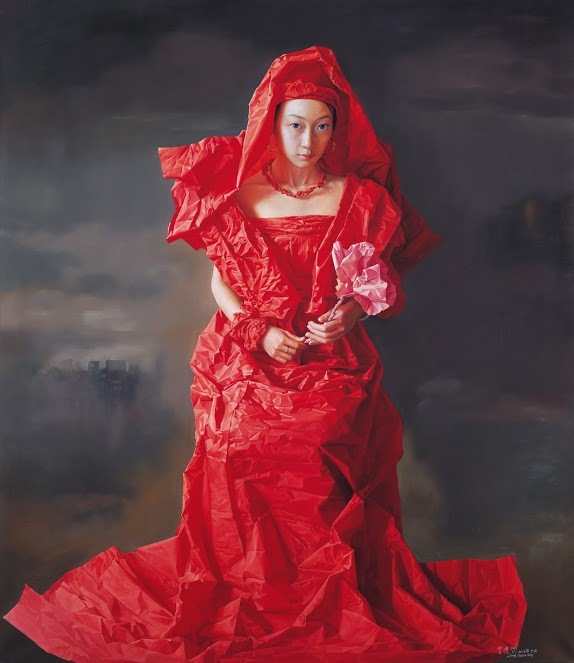 His paintings reflect on how marriage is built on the foundations of our frail mortality, and the high aspiration and ideals of love, emotional dependency and romance is fragile and can be as ephemeral as the paper in this motif. 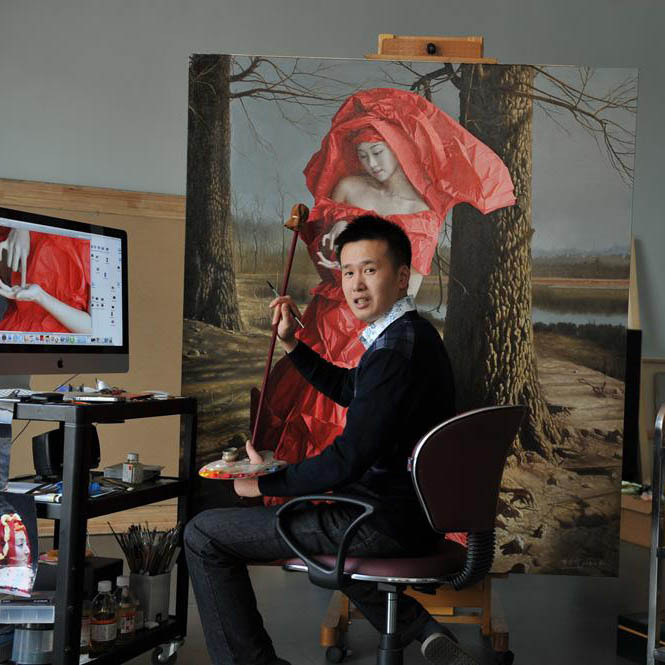 Zeng Chuanxin has an incredible sense for details and his award winning works have been critically acclaimed both within and outside of China. 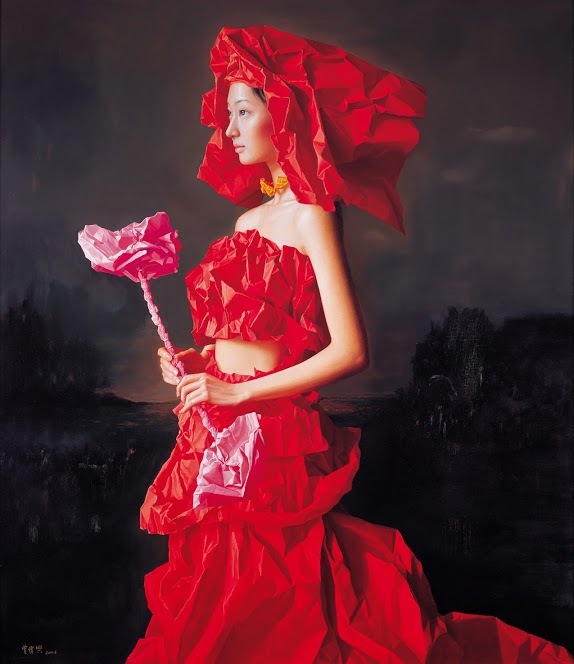 1999	Graduated from the Oil Painting faculty of the Central Nationalities University of Beijing. 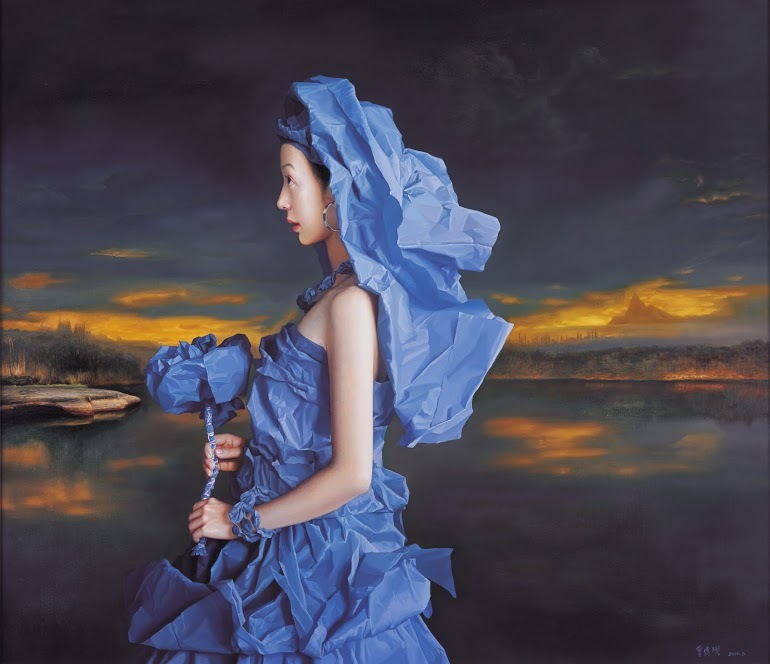 Since 2001, he has participated in numerous art exhibitions both within and outside of China. The genesis of the Paperbride series can be traced back to May 2003. While waiting for the Central Academy of Fine Arts post-graduate course application to open, Zeng Chuanxing caught up with a good friend. The friend was going through marriage difficulties and the topic of conversation naturally turned to the problems of marriage. Their conversation reflected on the increasing liberalization of society and how the accompanying changing social values have had profound impact on the institution of marriage in China. Expectations of love, emotional dependency and the romance of marriage have all increased dramatically, yet the notion that marriage is permanent and needs to be nurtured has conversely weakened. Returning to Changde in Sichuan, Zeng was unable to sleep for a few days. He continued to reflect on how marriage is built on the foundations of our fragile mortality. The aspirations, love and romance in a marriage often fades away with time, ground away in a thousand forgetfullnesses and insensitivities, unbeknownst in the rush of our everyday lives. People frequently have their eyes forward, looking to the next horizon, often forgetting the best time is in the now. 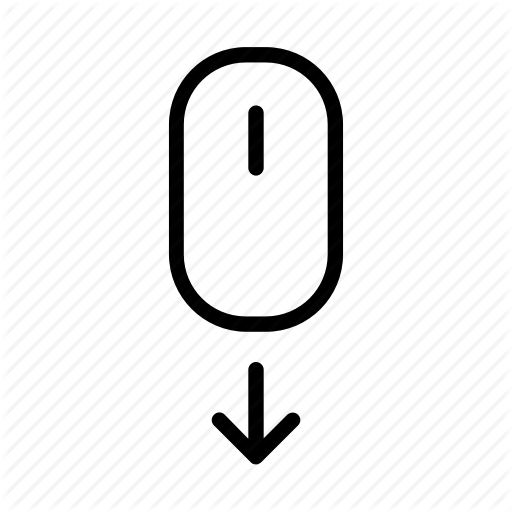 Ironically, one often looks back with bittersweet regret at times passed when we should have recognized that the moment - being transient - should have been treasured. His friend in Beijing had at one time been the dreamy romantic bride who could not have imagined the dispiriting sorrow of today. Whether it is fickle fate or perhaps the world just moving too quickly, the time of marital bliss and happiness is not indefinite. We gather a baggage of worries, fears, sadness and pain as we pass through our life’s journey. Yet along the way are the moments of happiness that should be treasured in our memories. 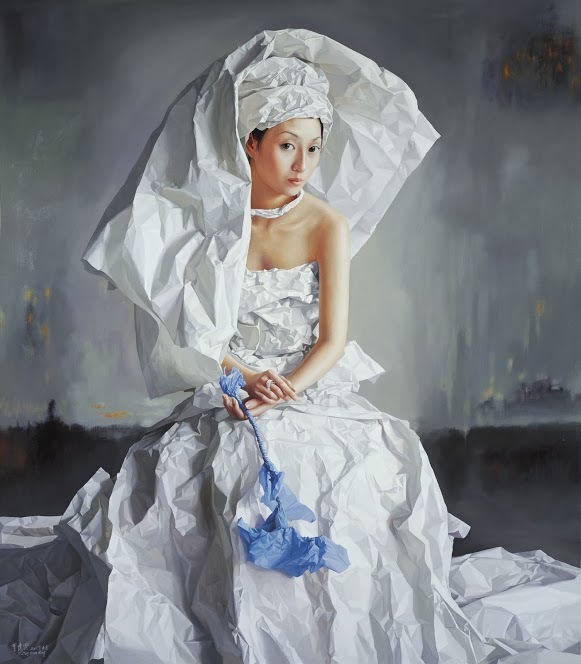 Zeng Chuanxing feels that as an artist, it is imperative that he brings this message through his art; his lovely, melancholic brides bring with them the freshness and hopes of a new marriage but at the same time, a warning that happiness is not something to be taken for granted and can be as ephemeral as paper. The genesis of the Paperbride series can be traced back to May 2003. While waiting for the Central Academy of Fine Arts post-graduate course application to open, Zeng Chuan Xing caught up with a good friend. The friend was going through marriage difficulties and the topic of conversation naturally turned to the problems of marriage.